For many RVers, life in a mobile home is both adventurous and comfortable. Although you never know where the road will take you, that’s no reason to abandon the luxuries of modern life. One such luxury that you may not have thought about is having a washer and dryer on board your motorhome. Whether you’re out for a vacation or you RV full-time, being able to clean your clothes on your rig is so much more convenient than any alternative. So, with that in mind, we want to take a look at the best washer/dryer combo units that you can install into your RV. Your next adventure can be all the better when you know that a fresh load of laundry is just an arm’s reach away. Let’s see how these machines can improve the RV lifestyle. As we’re about to see, most of these washer and dryer units have a lot of the same features. Thus, when comparing different models, you want to pay close attention to things like capacity, power, and how well it can install into your rig. Let’s see how the Della starts things off. Unless you like spending most of your day waiting for laundry to finish, you’ll want to get a dual machine that can both wash and dry clothes at the same time. This way, you can dry one load while another one is getting clean. One rule of thumb, however, is that the dryer on these kinds of units is only half the size of the washer. Thus, you will have to spend twice as long drying as you do washing, but the fact that they can be done simultaneously is still beneficial. As I mentioned, the load capacity for your machine is going to matter. On the one hand, you don’t want to take up too much space inside your RV, as every inch matters. On the other side, however, a larger unit can wash clothes much faster. Overall, this is about as large as you can get with these kinds of machines. Although you could choose separate washers and dryers that stack on top of each other, they take up way too much room, meaning that you have to have a massive RV to consider that option. Part of the appeal of doing laundry is that it doesn’t require your undivided attention at all times. While the clothes are washing or drying (or both), you can be off doing other things to help maximize your productivity. Coupled with the fact that you don’t have to go to the laundromat anymore, these machines are a life saver. To help you even further, this machine (and most of the ones on this list) have built-in timers for both the washer and the dryer. That way you can set it and forget it until it comes time to switch clothes from one bin to the other. Best of all, the timers are only set for 15 minutes and five minutes, respectively. These times show you how efficient this machine is when cleaning your clothes. As we’ll see, all of the washer/dryer combo units I’ve picked have a similar setup. They operate by washing and spinning your clothes, both in the washer and the dryer. Unfortunately, they don’t have a heater to expedite the process, but they are ideally suited for life on the road. Overall, I like the power and productivity of this unit, especially compared to some of the smaller ones we’ll see. Also, I like that it has a larger inlet and drain hoses so that you don’t have to wait too long for water to fill or flow from the machine. Although these machines are relatively autonomous, they don’t have the same sensors that modern washers and dryers do. Thus, you have to inspect your clothes to make sure that they’re clean enough to get dry. Also, plan on hanging your clothes outside to air dry, since the dryer only gets them about 80% done, assuming that you don’t overload the machine. As I mentioned above, choosing the right size washer/dryer for your RV is going to be essential. While models like the Della are perfect for relatively spacious motorhomes, units like this one from Do Mini are best for compact living conditions. Let’s see how well it does with washing and drying. Don’t let the title of this machine fool you. When it says 13 pounds, that means collectively between the washer and the dryer. That being said, it still has an eight-pound capacity for the washer, so you can expect to do most of a full load without any problems. 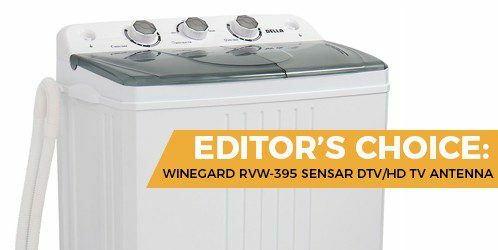 Even with a relatively spacious washer, this unit is much more compact than most. Thus, if you’re worried about taking up too much room in your RV, you will appreciate that this machine can fit almost anywhere without any problems. Remember, the dryers on these units are half of the washer. So, with an eight-pound washer, you can only do four pounds of clothes on a spin dry cycle. However, also keep in mind that the drying cycle is less than half the time to wash your clothes, so you can theoretically dry both batches before your next load is done. Compared to some of the other washer/dryer combos out there, units like this one are super easy to install. In fact, all you have to do is connect it to your sink (or a similar water inlet), hook it up to a drainage tank (i.e., gray water) and plug it in. Overall, you can be up and running in just a few minutes, provided that you have an adapter to connect to the faucet or hose. More than anything, I appreciate this model’s compact size. It can fit into almost any RV, even Class B motorhomes (if you know what you’re doing). Also, it’s simple setup means that practically anyone can utilize it wherever they are. Do Mini is not a high-quality brand, so sometimes you may get a machine that is a little worse for wear. Also, if something does break, getting a replacement unit can be a huge hassle. Finally, the inlet valve is tiny, so you’re usually better off dumping buckets into the machine, rather than waiting for the washer to fill on its own. With a name like Giantex, you can expect this washer/dryer combo machine to be larger than most others. Thankfully, however, it’s not excessively big, as it has about the same capacity as the Della unit above. Thus, if you have the space inside your RV and you want to make your laundry day more efficient, buying a model like this one will work a lot better than an ultra-compact version. One thing that I haven’t discussed yet is the power requirements for a machine like this. As you can see, it’s much too powerful to run off of a deep-cycle battery, so I highly recommend only using your washer and dryer when you’re connected to shore power. That being said, since this machine has a relatively high wattage, you can be sure that it will make short work of any load you have inside. Overall, I really suggest that you buy a unit like this one that can do almost a full load of laundry at once. Although it won’t be the same as the machines you have at home (or at the laundromat), they are perfect for life on the road. Another thing to remember is that you will likely have to use the washer and dryer continuously, either all day on laundry day or every couple of days if you want to stay on top of your dirty clothes. Thus, having a reliable motor is a must, lest it burns out and leaves you without a machine for the time being. As you may have noticed, these combo units all have clear lids on top so that you can see what’s going on inside while it operates. Although this feature isn’t necessary, it can help you determine whether it’s working properly. Another benefit of having clear lids is that you can monitor your clothes to see how well they are getting cleaned. If the top layer isn’t getting wet, for example, then you’ve probably overloaded the machine, and you can make a note of that for the next cycle. As with the Della model, I appreciate the size of this combo unit. I like that I can wash and dry clothes at the same time and that the motor is powerful enough to run continuously without any problems. Another thing you may have noticed about these machines is that they don’t usually come with warranties or guarantees. Unfortunately, that’s because a lot of manufacturers use relatively cheap parts, and Giantex can be guilty of that from time to time. One of the more prevalent issues is that the connection for the drainage tube on the bottom may rust and fall apart after a while, leading to leaks. Be sure to inspect it regularly so that you can avoid any disaster in your RV. Although this machine has the name Xtremepower, don’t expect it to work that much better than anything else on this list. Also, considering that you have to plug into shore power anyway, you probably don’t want a washer and dryer that uses more electricity than necessary. Let’s see how this model compares to the others. Comparatively speaking, this is not a small machine. With a relatively decent capacity (more on that below), you would expect it to take up more room in your RV. Thankfully, it’s much shorter than other models of its class, meaning that it’s better suited for life in a smaller motorhome. The other benefit of this combo unit’s short design is that it’s much lighter than most other models in its class. Rather than weighing over 30 pounds, this machine is about 25, so you can move it from place to place much more easily. For the most part, you won’t be able to install your washer/dryer in a single place inside your RV. Instead, you will have to connect it to a drain and inlet hose each time you need to do laundry. Thus, having a lighter model can make this transition much smoother. Overall, I would say that this machine is a happy medium between the relative behemoths that have 11-pound washers and the super compact models that only have about six pounds of space inside. Thus, even if you don’t have much room for a washer/dryer in your RV, you can still get clothes clean efficiently and quickly, rather than spending all day washing two full loads. This is an easy to use unit, and it works well every time. I like that it has a decent capacity without overwhelming your RV’s storage space and that it’s quick to set up and take down. As with other models, the tubes where water drains out can rust and wear out relatively quickly. Thus, if you want to avoid mopping up gallons of water from your RV, I suggest inspecting them regularly. Also, the lid on the dryer doesn’t stay as tight as it should, so it may spray a little water when spinning. Just keep a towel over it, and it should be okay. If you have a Class A or Class C motorhome, or you’re traveling with children (and thus make more dirty clothes), you will want to buy something like this unit from Best Choice Products. This is the largest combo model on this list, making it ideal for people who need to do a lot of laundry at once. Although the size of this unit is not excessively big, it’s still more significant than anything we’ve seen thus far. The washer maxes out at 12 pounds, and the dryer can hold about seven pounds, meaning that you can wash more clothes in less time. That being said, the size and weight of this machine are commensurate with the capacity, so don’t assume that it will be super easy to move it around your RV, especially when it’s full of clothes. Because you have so much room inside the washer, you need to be able to fill it quickly instead of waiting for 20 minutes. Thankfully, this machine has two inlet valves so that you can put water inside twice as fast. However, if you don’t have two water sources, then it may not be as much of a benefit. As I mentioned, most of these machines don’t come with a warranty. This washer/dryer is no different, but at least you get a guarantee. I highly recommend testing it several times within the return window so that you can get a replacement if necessary. If you’re worried about spending hours cleaning clothes, you will appreciate the size and efficiency of this model. I also like that it has two inlets and that it comes with a (limited) guarantee. Although this problem is rare, it’s something you should note, especially if you’re within the return window. At times, the machine can vibrate violently when the dryer is active, meaning that it’s both loud and it will move around a lot. If that does happen, get a replacement ASAP. Rather than go over the various features and benefits of these washer/dryer combos (since I’ve covered most of those in the reviews), I’m going to offer some essential questions you should be asking when comparing these machines. Overall, you want to be able to answer these questions satisfactorily when picking a washer and dryer; otherwise, you probably will have to buy a new machine to get the job done well. If you’re only planning on RVing for a few days at a time, then you may not even need one of these devices on board. Save the room. How Will It Affect Your RV’s Decor? Just because your washer/dryer is not in use doesn’t mean it’s out of sight. Consider the fact that you’ll have to look at the machine, as well as move it around as necessary. Is it going to be more trouble than it’s worth? How Many Loads Will You Have to Do? When talking about load capacity, you’re probably not that familiar with the size comparison. Thus, I recommend looking at the capacity of your home washer and dryer (or go to the laundromat if necessary). Looking at those numbers will help inform the size you should get for your RV. For example, most washers can hold up to 16 pounds, with larger units going up to 20. So, if you get an eight-pound model for your RV, you can do half the clothes as usual. Another thing to consider is if the machine is large enough to wash linens and bedspreads while you’re on the road. If not, then is that going to be a problem? What Happens if You Overload the Unit? In most cases, your clothes will just take longer to get clean and dry. However, also consider that it will put more pressure and wear and tear on the motor, which can cause it to fail faster. Overall, don’t exceed the recommended load limit, even if it’s going to take longer. Because most of these machines have similar benefits and features, it can be hard to narrow down a top pick. They all have relatively identical setbacks as well, such as a lack of a heater. However, when it comes to reliability, size, and efficiency, I highly recommend the Della Washing Machine. Although it’s not as ideal as having two units at home, it’s perfectly suited for life on the road. Overall, you can use this washer/dryer combo over and over again without any issues, and it’s large enough to ensure that your clothes get clean as efficiently as possible. Compared to the other units on this list, the Della is the smart choice.